Today is the evening of Mexican Independence Day and I didn’t know if I was going to go out with El inglés, aka, my husband to celebrate, so I organised to cook a proper Mexican dinner and I bought everything to make “Chiles en Nogada” but at the end we ARE going out, so my plans have changed and l decided to cook something easy, simple and delicious, my Cactus Salad is the perfect dish, you can make it a more filling meal if you grilled some chicken breast and have some rice as well. 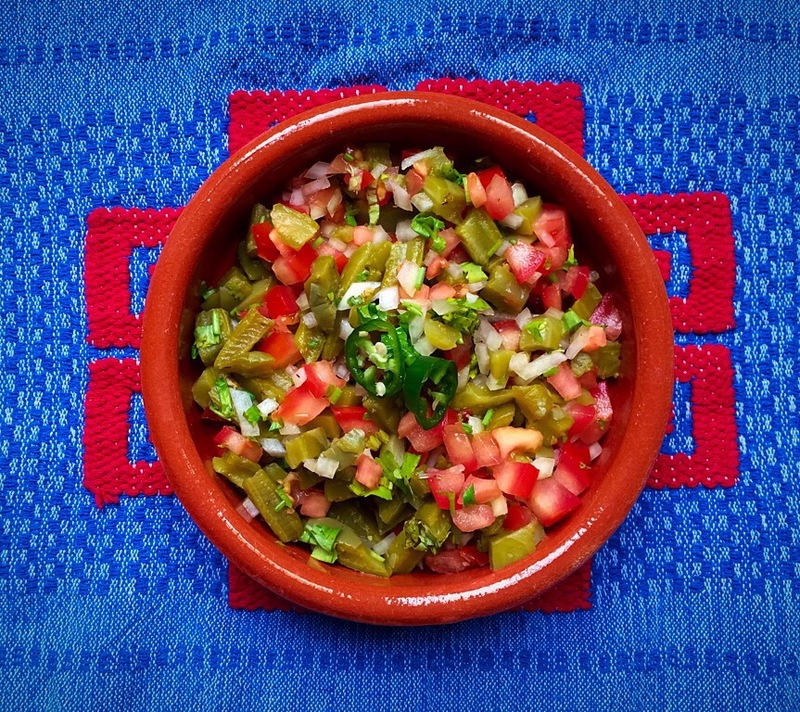 There are two ways to make this salad, the first one is to buy fresh cactus and cook them yourselve, that would be the best option as the cactus would be more crunchy and fresh, but if you, like me, live outside of Mexico and there is no way that you could get fresh cactus anywhere, the second option is for you, buy cactus in a jar, nopalitos, yes! I know they won’t taste the same, but it would do the job and if you find one that doesn’t have a lot of vinegar, it would taste nice. I usually remove all the onions and chillies that they come with, then I wash them very well several times and sometimes I even leave them for half an hour to soak in clean water and the taste of vinegar goes away. Try to do these tricks and hope for the best. Anyway, I will give you the recipe for both, fresh cactus and cactus in a jar. If you are using fresh cactus, chopped them into little cubes, put them in a casserole dish with a small garlic, half an onion and cover them with water, cook them at medium heat for aroun 30 min or when the cactus have change to a pale green colour, there is no need to add salt, as you add the salt later. 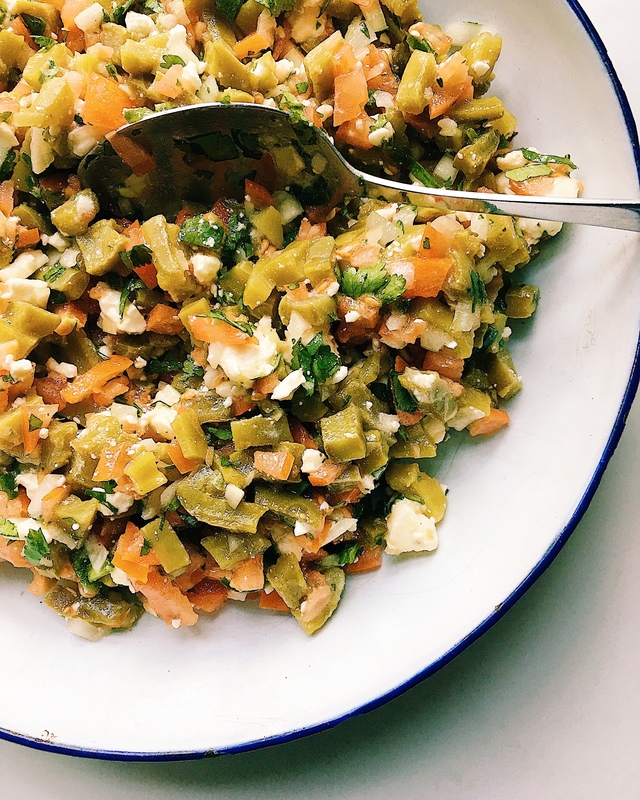 If you are using cactus from a jar, drain them very well, remove all the onions and chillies and wash them through very well, then chopped them into little cubes. Then add all the chopped vegetables, add salt the taste and a pinch of oregano and it is done! Leave it in the fridge for 15 min to rest so all the ingredients mix nicely and enjoy. So easy, but so tasty. I used cactus in a jar from “La Costeña” because here in London it is impossible to find fresh cactus.